And echo the man's grief. For someone who never visited, he got some of it wrong but quite a lot right. Pátmos is in fact “splendidly situated” – the eyeful of neighbouring islands and Asia Minor from the vast Platía Lótza in hilltop Hóra is up there among the best views to be had in the Greek islands. It does get its share of the “shipwrecked...homesick or grieving”, and for those with the right ear there are plenty of “offspring...voices” to be heard; I once took a girlfriend of pronounced psychic abilities to the ancient acropolis on Kastélli hill above Skála, and she claimed the place was thronged with spirits. But a scribbler who apparently did sojourn here, St John the Evangelist, first established Pátmos in western consciousness. Exiled by Roman Emperor Domitian between AD 81 and 95, John (O Ágios Ioánnis O Theológos in Greek; thus every third male Patmian answers to the name Theologos) supposedly dwelt in a hillside grotto (not a “dark sea-cave” as Hölderlin would have it) while writing the last book of the New Testament, Revalation (Apocalypse in Greek), as well as his gospel. Between bouts of writing, John found time to eradicate paganism on Pátmos, in the person of the evil wizard Kynops. In a duel of miracles, O Theologos bested Kynops by turning him into an undersea rock – a buoy near Skála’s town beach marks this unmovable anchorage hazard, and fish caught here supposedly are inedible. Nearly a millennium later, in 1088, the seal was set on the victory of Christianity when soldier-monk Khristodoulos, bearing a charter from Byzantine Emperor Alexios Komnenos granting him title to the island (as well as tax exemption and the right to a fleet), landed here and began work on a fortified hilltop monastery directly atop a temple to Artemis, the island’s main ancient patroness. The Blessed Khristodoulos (after whom another third of local men is named) and his party admired the building appreciatively before destroying it, incorporating its masonry into the new foundation, which grew gradually over the years. For essentially another millennium, the monks effectively ran the island, though after a while they no longer owned all of it. In recent decades things have relaxed considerably, with respectable (if not head-banging) nightlife in the port-town of Skála, and (shock-horror) a few nudist beaches around the coastline. But the dominant tone still seems set by the annual, early September Festival of Religious Music, staged in a hillside amphitheatre and featuring top choral performers, though of late there’s a considerable leavening of secular concerts to widen its appeal (see www.patmosfestival.gr for this year’s programme). Since Pátmos has long been a fixture on cruise-ship and sailing yacht routes, day-trippers still outnumber overnighters, and the island feels an altogether different place late at night. Among those staying, no one nationality among many predominates, lending Pátmos a cosmopolitan feel. Repeat clientele can be very upscale indeed – members of the fourth Aga Khan’s extended family and the ex-Yugoslav royal family maintain properties here, while the Belgian and (deposed) Greek royal families are frequent visitors. It is also claimed that local property-owner and digital magnate Nicholas Negroponte, brother of US diplomat and intelligence wonk John Negroponte, has been instrumental in providing public wifi signal to much of the hilltop village of Hóra. Enough, for now, of history, theology, and name-dropping – what can you expect as a visitor to Pátmos? First of all, stunning scenery, with volcanic rock formations everywhere; exquisite architecture, that owes far more to the Cretan workmen in Khristodoulos’ party, and later Venetian influence, than anything indigenous to the Dodecanese; some tasty restaurants that the cruise-ship patrons rarely find; and a garland of really excellent beaches, again something you’ll only enjoy by overnighting. And while it may appear a hopelessly arid island, some lucky soundings in 2006 tapped a vein of fresh potable water coming over from Turkey, with taps in Skála and Kámbos. Skála is Patmos’ port and biggest village, with most of the official population of 3200. It only dates from the 1820s, when the Aegean was effectively cleared of pirates, and can’t really compare to other island capitals like Mýkonos or Parikiá in allure, but since it has most of the local lodging, you may well end up staying here or in the immediate environs. If the trippers strolling the quay or browsing the up-market boutiques get too much, head west towards rocky Hokhlakás cove for the best sunsets around. For a better beach, head west from the excursion boat quay to a nice patch of sand – called Theológos – beyond the Kynops buoy. Further along the bay, at Nétia district, wooden kaïkia are still built or repaired in the traditional way at photogenic boatyards. Here are some tried-and-tested eating and drinking options. Ouzeri to Hiliomodi, start of the road up to Hóra. Lovely seating in the lane behind, veggie starters and seafood delicacies like limpets (served live – so they flinch when you drizzle lemon juice on them). Ouzeri Ostria, just in from the excursion boat quay. Quality can vary, but it’s open all day and until after midnight – late ferry arrivals take note, this is the only place you’ll get fed properly. Tzivaeri, opposite Theológos town beach. Dinner only, but open all year, featuring Cretan mezédes and occasional live music at weekends. Trehandiri, on the path-street to Hokhlakás near the old OTE. Only opened in 2012, but despite a no-view inland location, lines formed all summer for the sake of good-value octopus and little fried fishes, plus bulk wine or ouzo. Benetos, Sápsila cove, 2km southeast of Skála. Idyllic conservatory seating and a Mediterranean fusion menu, rated second to Vegghera’s (in price too), which might feature smoked sardines, bean-and- salmon croustade, astakomakaronádha and decadent desserts. June–early Oct Tues–Sun supper only; reserve in summer (tel 22470 33089). Arion, excursion boat quay. Not a restaurant but the town’s oldest café-bar; Wild West saloon getup inside, unrivalled people-watching outside. Koukoumavla, Konsoláta district near Hiliomodi. The “Little Owl” is the town’s “alternative” cafe–bar, with wacky decor, garden seating, snacks and frequent events. Daily except Mon from 10am. Just over halfway along the path lies the monastery of the Apocalypse (Apokálypsis in Greek; daily 8am–1.30pm, also Tues, Thurs & Sun 4–6pm), built behind the fissured volcanic grotto where John dwelt and heard the voice of God. He dictated the revelation to a disciple, Prokhoros – yet again supernaturally, since the latter apparently lived some centuries after the Evangelist. I liked very much a leaflet left for pilgrims over many years, pointing out that the “fissure...[divides] the rock into three parts, thus serving as a continual reminder of the Trinitarian nature of God” and further admonished visitors “to ask yourself whether you are on the side of Christ or of Antichrist”. This provocative literature is now gone, but the presumed resting place of the saint’s head is fenced off and outlined in beaten silver. The grotto compound is merely a foretaste of the monastery of Ayíou Ioánnou tou Theológou (St John the Divine) (same hours as Apokálypsis). “Modest” dress is essential, and the monks, fed up with hordes of tourists, can seem brusque, so be discreet. Coach tours from the cruise ships pack out the place between 10am and 1.30pm, so go early or late in the day. The best time to show up, besides the famous Easter Thursday observances, when the abbot washes the monks’ feet in imitation of Christ bathing his disciples’ feet, is September 25–26 (Feast of Ioannis O Theologos) and October 20–21 (Feast of Khristodoulos), both marked by solemn liturgies and processions of the appropriate icon. A warren of courtyards, chapels, stairways, arcades, and roof terraces (the latter sadly off limits), the monastery offers a rare glimpse of a medieval Patmian interior. Immediately to the left as you enter is the narthex of the main church, brilliantly decorated with late medieval frescoes, mostly scenes from the life of Khristodoulos, though there are other episodes such as the Forty Martyrs of Sebastaea. Further in, the treasury (6-euro admission) very nearly justifies the hefty fee for its magnificent array of religious treasures, mostly medieval icons of the Cretan School – including St John Damascene wearing a keffiyeh – and liturgical embroidery of the same era, particularly two satin shrouds threaded with gold for the epitáfios or bier of Christ, carried in solemn procession on Good Friday eve. Among the multiple donations of the pious from across the Orthodox world, especially Russia, a filigreed cross of incredible delicacy stands out. Pride of place goes to the eleventh-century parchment khrysóvoulos (chrysobull) of Emperor Alexios Komnenos, granting the entire island to Khristodhoulos. The well-stocked gift shop at the end offers a catalogue and high-quality reproductions of favourites. The famous library is unfortunately open only to credentialled ecclesiastical scholars. The promise of security by Ayíou Ioánnou’s stout walls spurred the growth of Hóra immediately outside the fortifications from the late thirteenth century onwards. Despite earthquakes and the demolition of buildings by the Italians during the 1930s to create open space, it remains an architecturally homogenous village, with occasionally arcaded, cobbled alleys sheltering dozens of shipowners’ mansions, most dating from Pátmos’ seventeenth- and eighteenth-century heyday. High, small-windowed walls and monumental wooden doors betray nothing of the opulence within: painted ceilings, hokhláki terraces, flagstoned kitchens with carved cistern heads, carved furniture and embroidered bed-curtains. Inevitably touristic tattiness disfigures the main ramps approaching the monastery gate, but away from the principal throughfares you stumble upon rarely trodden passages, no wider than one person, lined with ruins or overgrown with night-fragrant four-o’clock bushes (called dilináki locally). On summer nights, when the monastery ramparts are floodlit to startling effect, Hóra is the most beautiful settlement in the Dodecanese. Neither should you miss the view from Platía Lótza, towards the west end of Hóra. Easiest glimpsed at dawn or dusk, the landmasses to the north – going clockwise – include Ikaría, Thýmena, Foúrni, Sámos with the brooding mass of Mount Kérkis, Arkí, Lipsí and the double-humped Samsun Dag (ancient Mount Mycale) in Turkey. There are dozens of “minor” churches and monasteries in and around Hóra, many containing beautiful icons and examples of local woodcarving; all are locked, to prevent thefts, but someone living nearby will have the key. Among the best are Diasózousa, the convent of Zoödóhou Piyís (daily 9am–1pm & 4–7pm) well southwest of the village, and the convent of Evangelismoú, at the edge of village in the same direction (daily 9–11am); follow the wall-arrows. Much the best value of Hóra’s few tavernas is late-serving Pantheon (open Easter–Jan 1; tel 22470 31226) at the start of the monastery approach, where good atmosphere and taped music, a lovely old interior or terrace views over the village and friendly management offset somewhat average mezédhes. There are, though, almost no places to stay if you’re not one of the lucky outsiders who’ve bought up and restored almost half of the mansions since the 1960s. Heading back down to Skála on foot, you can fashion a loop by using the now-admirably signposted footpath, beginning from beside the row of windmills north of Hóra. Due east of Hóra is the protected bay of Gríkou (aka Gríkos). Despite the beach being of hard-packed sand (and doubling as the frontage road), it’s a popular dormitory with the biggest concentration of island accommodation after Skála – though all of it is shut tight as a drum come early September. Local eating options are open more consistently: at the south end of things, at Pétra cove, is the best rural taverna on Pátmos, Ktima Petra (Easter–Oct 7; reserve in summer tel 22470 33207), with brown bread, lush salads, homemade dolmádes, carefully cooked casserole dishes, plus grills after dark. En route, you pass hillside Flisvos (tel 22470 31380), now rather eclipsed by Ktima Petra but known since the 1970s for inexpensive, savoury casserole dishes. The far end of Pétra beach – beyond the strange volcanic outcrop of Kalikatsoú, honeycombed with caves fashioned by Paleo-Christian hermits – is colonized by nudists. There are several such tiny, rock-sheltered coves in a row, but only the end ones are easy to reach on foot – no vehicles, even tough scooters, can negotiate the rough onward track to Diakoftí isthmus with its busy boat-yard and adjacent Taverna Tarsanas (tel 22470 31903), an improbably popular spot for power-lunches, most of the year. Vehicle arrival is by a turning on the paved road system, from Hóra. Lots of parked scooters mark road’s end just beyond the isthmus – and the trailhead for the very enjoyable 25-minute walk southwest on a proper path to Psilí Ámmos(photo). 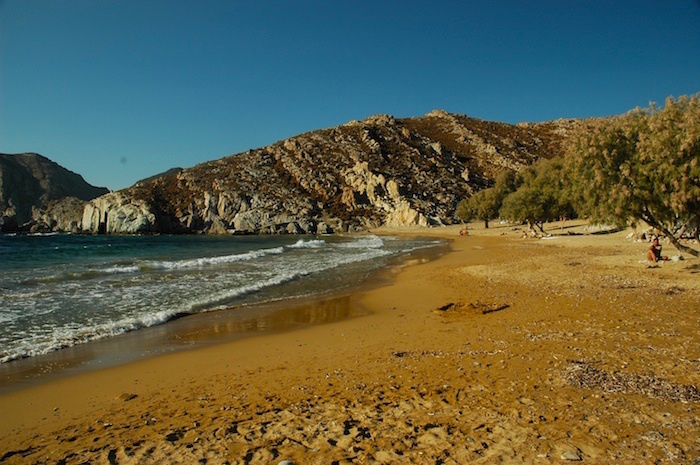 This is the island’s only pure-sand bay, with shade from tamarisks and a good, lunch-only taverna that occasionally does roast goat, culled from their own flock on the surrounding hills. Cliffs and hills to either side create a dramatic backdrop, though the seabed itself shelves gently; however, as the picture shows (if Matt posts it), there can be quite a surf, and sloppy sea, by late afternoon. By long-established custom, the southern half of the beach is naturist. In summer Psilí Ámmos can also be reached by taxi-boat (15 euros at last look), which departs from Skála at about 10am and returns at 4-5pm depending on season. More than half the island, whose map outline resembles a seahorse facing east, lies north of Skála. Here you’ll find just two other hamlets (Kámbos, and Kambí beyond), plus the majority of Pátmos’ famous beaches. The best ones face east, or south; west-facing bays are generally unusable owing to the prevailing wind and washed-up debris. All are accessible from side roads or rough paths off the main road. Hiking on Pátmos is generally not rewarding; there’s been too much villa-building and bulldozing, though a few decent trail-walks – such as one from Lámbi to Livádi Kalogíron – have recently been waymarked and their starts signposted. 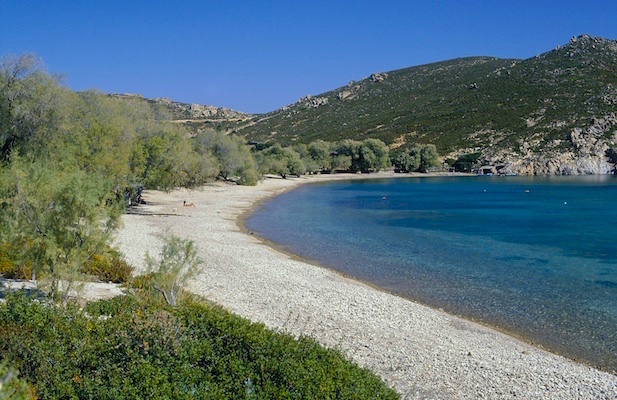 The next bay up from Skála harbour, Melóï, is handy and attractive, with tamarisks behind a narrow belt of sand, good snorkelling, a decent campsite and a competent lunchtime taverna, Stefanos. Agriolívado (aka Agriolivádi), next up, is bigger, with several sunbed/kayaking concessions and a choice of tavernas: fish specialists Glaros on the southerly hillside, and another at mid-beach. Kámbos beach, downhill from the eponymous hamlet, is somewhat blighted by the road backing the sand, though with its two tavernas (none worth singling out) and watersports facilities, it’s popular with Greek families. East of Kámbos, along the “snout” of the “seahorse”, are still more, quieter coves. Vayiá (pebbles, coarse sand) has a snack bar, while the nudist, double bay of Ligínou (path access only) has a seaonal kantína shack. Long, sand-and-gravel Livádhi Yeranoú (aka Livádi Dellapothítou-in photo) offers extensive shade from tamarisks and discreet naturism at the far end, plus a very good, inexpensive cult taverna at road’s end, doing simple seafood dishes, chops, keftédhes, hórta and salads. Just offshore lies the small islet of Ágios Geórgios, which you can easily swim out to, with a little beach to rest up on before the lap back. From Kámbos another road heads north to Lámbi bay, best when the prevailing wind is from the south, and renowned for an abundance of multicoloured volcanic pebbles (mixed with gravel and sand); signs forbid you from collecting any, but they’re irresistible. Of two local tavernas, I favour Lambi (Pandelis; Easter to Oct 15; tel 22470 31490) on the beach for seafood, though the menu can be very brief outside peak season. Livádi Kalogíron, should you walk or scooter there, has a stony, wave-battered beach but a very attractive monastery, set amongst its vegetable gardens just inland. Léfkes cove, west of Kámbos, is a bit sandier but just as exposed. The valley leading to it was the focus of a woo-woo cult founded by a Greek woman and her British partner during the late 1970s; the monastic monks sent them all packing in 1982. The excursion boats lined up in front of the Café Arion can take you, weather permitting, to a selection of islets east of Pátmos. Do, however, check if the schedule of the milk-run ferry Nisos Kalymnos is more obliging; it heads to Arkí in particular at about 9:30 to 10am, returning at around 6pm, and is far cheaper plus more seaworthy. Arkí (population ca. 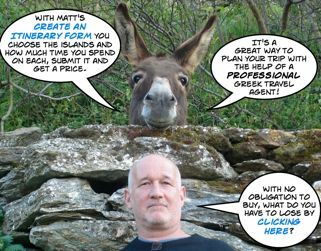 35) has long been a favourite with yachties, owing to its incredibly sheltered Port Augusta bay; excursion boats sail right to the head of the bay, while the Nisos Kalymnos uses the jetty at the opening, next to which is Patélia, one of the islet’s few sandy beaches. Excursion boats may also take you to the so-called “Blue Lagoon” of Tiganákia at the east end of Arkí. There are three tavernas for lunch. For fatter sand, head instead to Maráthi, essentially one long beach and three taverna-rooms behind it (we favour Marathi, aka Mihalis’ after its pirate-garbed proprietor). Lipsí is a bit more of a stretch time-wise, and for many deserves an overnight or two. Excursion-boat schedules don’t really allow for anything outside the port town unless you rent a scooter to get to remote coves like Katsadiá (excellent taverna, Dilaila), and the nudist coves near Monodéndri in the far northeast. With just your feet, you’re confined to the sandy Lipsí town beach of Liendoú, or Kámbos a little further along. Town tavernas are adequate but not stellar. The best commercial product for Pátmos is Terrain’s 1:20,000 map number 335. 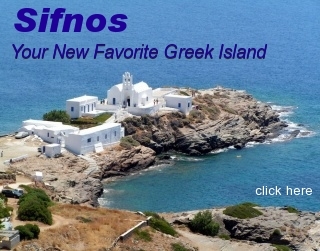 For the islets to the east, it’s their 1:20,000 map number 334 “Arki, Lipsi, Agathonissi”. See http://e-shop.terrainmaps.gr. Giveaway maps found in the annual Pátmos listings magazins are adequate for travelling around by bus, but not for hiking or visiting any really remote coves. 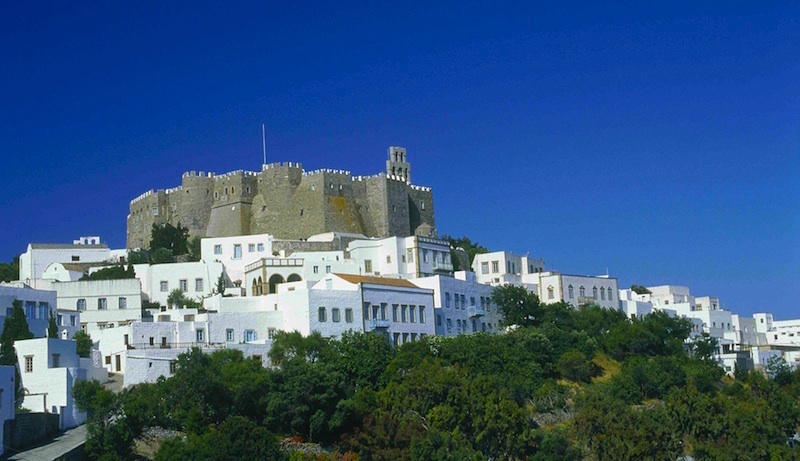 For more hotels on Patmos with photos, information, reviews and rates see Booking.com's Patmos Pages. Sámos has the closest airport, but confirm connecting ferry or catamaran departures from Pythagório carefully (by phone, not just online) or you risk being stranded, especially with late afternoon arrivals from overseas. You need to land by 1.30pm to be assured (using a taxi) of making the three weekly 2.30–3.30pm departures of the Nisos Kalymnos from Pythagório, arriving in Pátmos at 6.30–7.30pm. All ferries and catamarans arrive at the same jetty in Skála. Whether starting from Rhodes/Kos or Piraeus, arrival times of the Blue Star craft (currently with a monopoly on this line) fall between 11.30pm and 3am. Several times weekly the expensive catamaran Dodekanisos Express or Dodekanisos Pride calls from Rhodes and Kos. Among various car- and scooter-rental places in Skála; we’ve had good service on bikes from Billis and Aris. Cars are expensive and only really for groups/families. Public KTEL buses ply to Hóra and Gríkou regularly, as far as Kámbos beach less often.